Watch what you say... tiny bones forming in baby's ears mean the little one can now pick up your voice. Eyebrows, lashes and hair are starting to fill in, and taste buds are forming. And, if you're interested, an ultrasound might be able to determine gender. Get ready for a growth spurt. In the next few weeks, your baby will double their weight and add inches to their length. 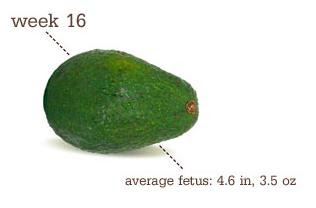 Right now, they're about the size of an avocado: 4 1/2 inches long (head to rump) and 3 1/2 ounces. Their legs are much more developed, their head is more erect than it has been, and their eyes have moved closer to the front of their head. Their ears are close to their final position, too. The patterning of their scalp has begun, though his locks aren't recognizable yet. They have even started growing toenails. And there's a lot happening inside as well. For example, their heart is now pumping about 25 quarts of blood each day, and this amount will continue to increase as your baby continues to develop. Information from BabyCentre and The Bump. You look great with your perfect little bump! Sweet jesus! You are the cutest pregnant lady EVER!!! Here's to continuing to feel good! Your baby bump is too cute! I love the information you're posting. I'll have to remember that when we "get there" someday! You look SOO cute! How fun to be able to feel the baby already!